Being fifty-something, I’m fiercely aware of the “use it or lose it” mantra. I’m consciously trying to stay on the move, standing instead of sitting, walking instead of driving and walking for the sake of walking. Just. Walking. 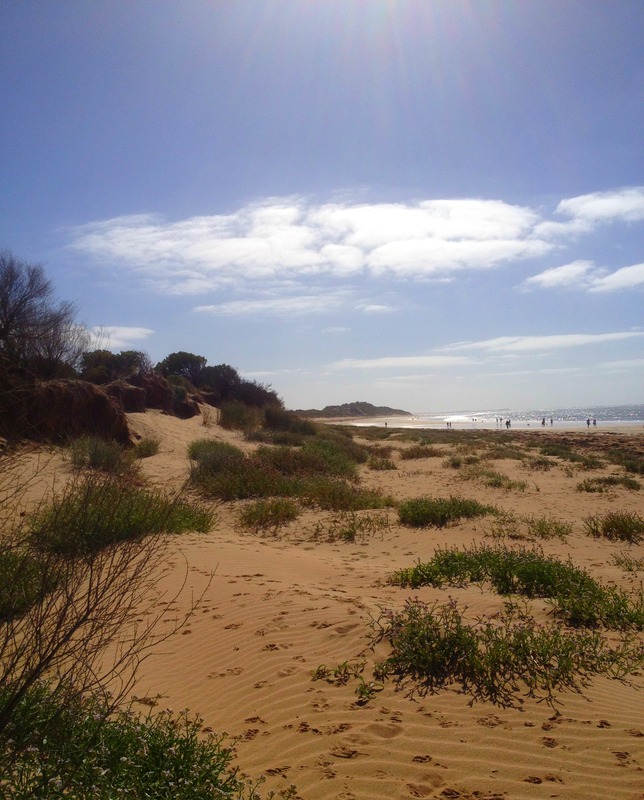 We recently promised ourselves we’d walk the full length of the Surf Coast Walk, one section at a time. Or half a section at a time. Whatever we can manage. 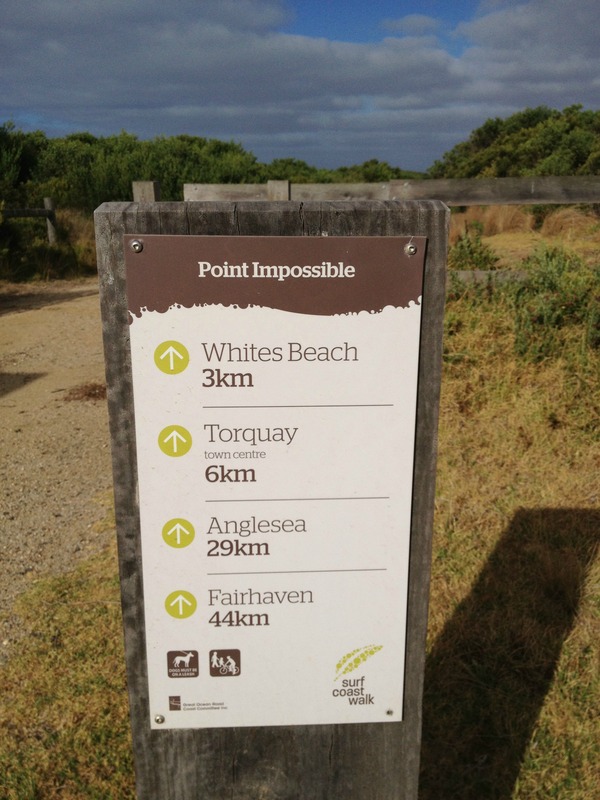 The Surf Coast Walk is a 44km trail that ribbons along Victoria’s surf coast, from Point Impossible to Fairhaven. It’s designed as a hop-on/hop-off experience, so you can walk it all at once, or bit by bit. We begin our promise early on a sunny Sunday morning at the Point Impossible car park. According to the brochure, we have 11.4km ahead of us – 5.7km to Yellow Bluff and 5.7km back – and can expect the section to be mostly flat with no steps and a well-formed path. We linger in the car park briefly, pretending (to whom?) that we’re part of the early morning surfie brigade checking out the break below from the clifftop vantage point. Who are we kidding? 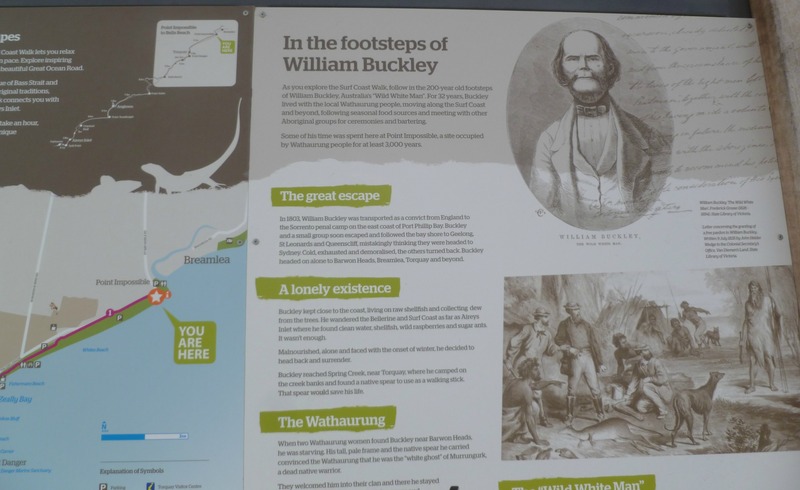 (Because someone we know might have written it), we read the interpretative signage which serves up the low-down on the local flora and fauna, the Aboriginal history and legendary big man, William Buckley. We head off on the track, setting a cracking pace. 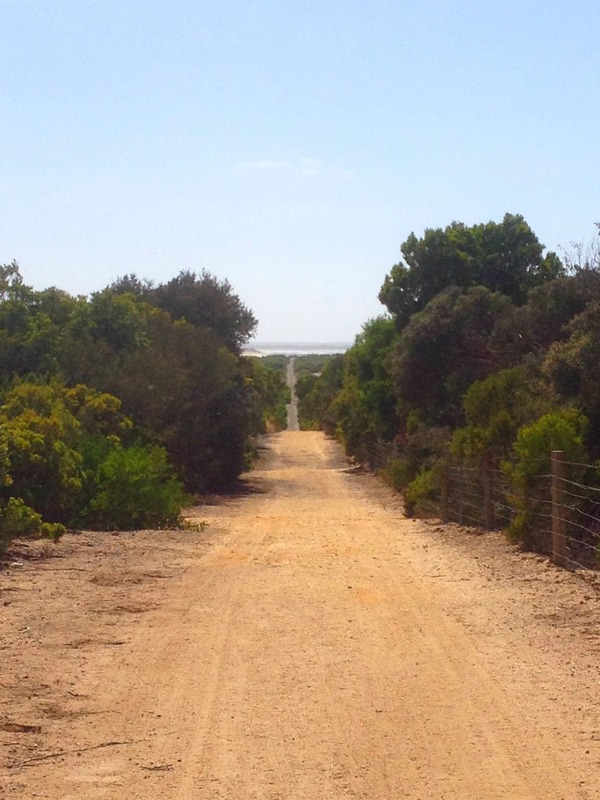 The path runs through coastal vegetation between the Point Impossible Beach and rural land, just behind Torquay Tigermoth World. Point Impossible Beach is a “clothing optional” zone. No need to panic; sand dunes separate the walking trail from the beach. We keep our eyes averted. Just in case. Every now and then a rabbit appears and hops across the path in front of us. We can hear birds scurrying in the heathland and above, the drone of a light airplane. A tigermoth? 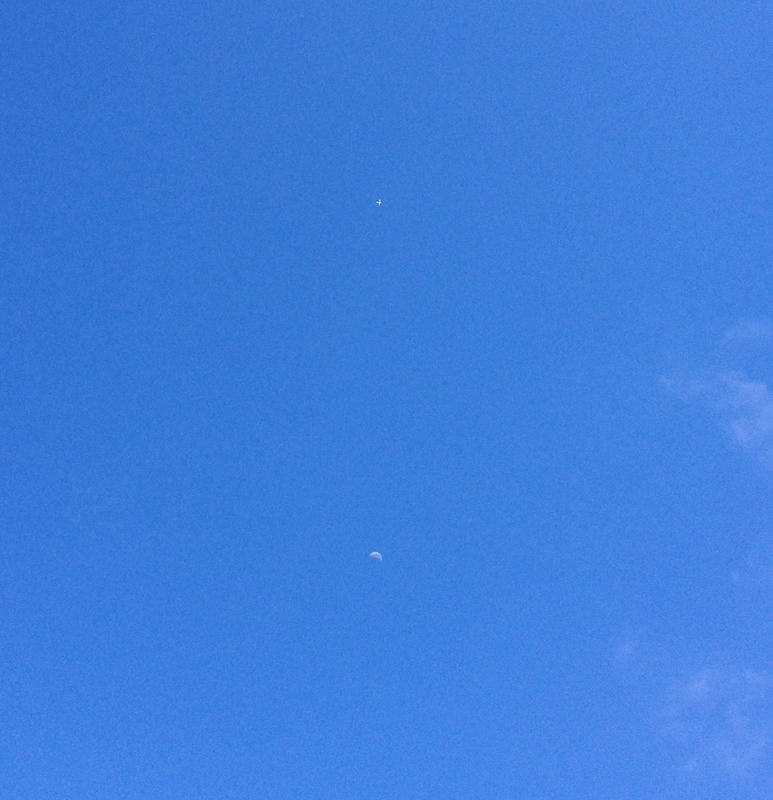 In the blue, blue expanse above we spy a dwarfed white plane and a crescent day moon. 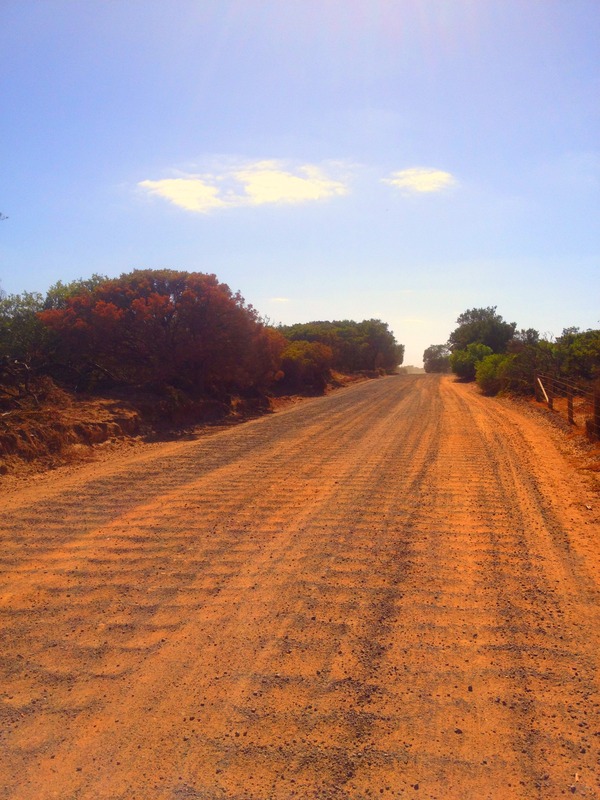 After a couple of kilometres, the white gravel trail gives way to a corrugated reddish gravel road and eventually we find ourselves on a trail winding along the beach side of The Esplanade, just across the way from the impressive homes of the Torquay Sands Estate. We’re curious, so we take one of the paths leading down to Whites Beach. 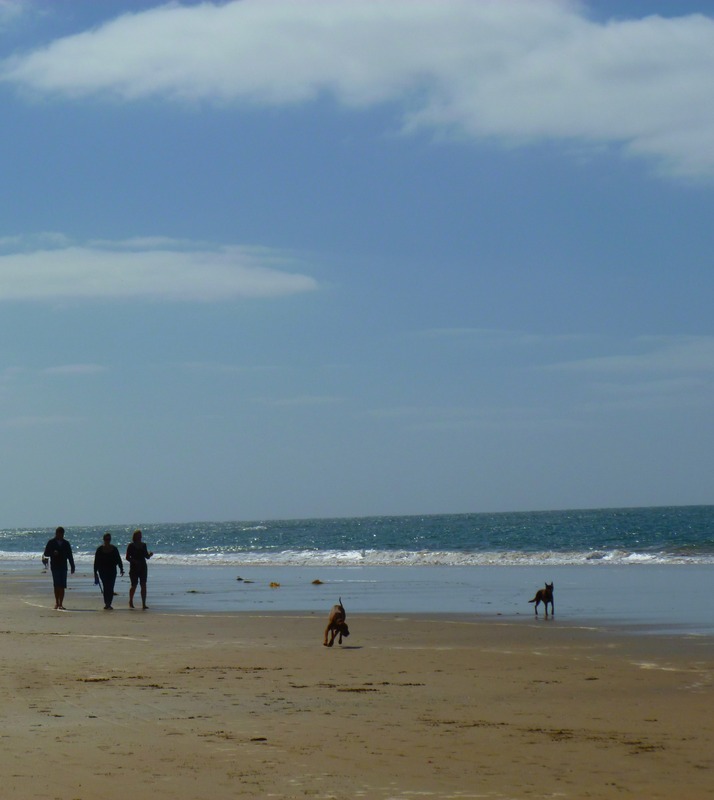 We’re delighted when the landscape opens up to the broad expanse of beach, peppered with other morning walkers and a smattering of lively dogs enjoying a frolic off-lead. Leaping high to catch frisbees. Bounding through the shallows. Sniffing each other’s bums. Normal happy doggy stuff. 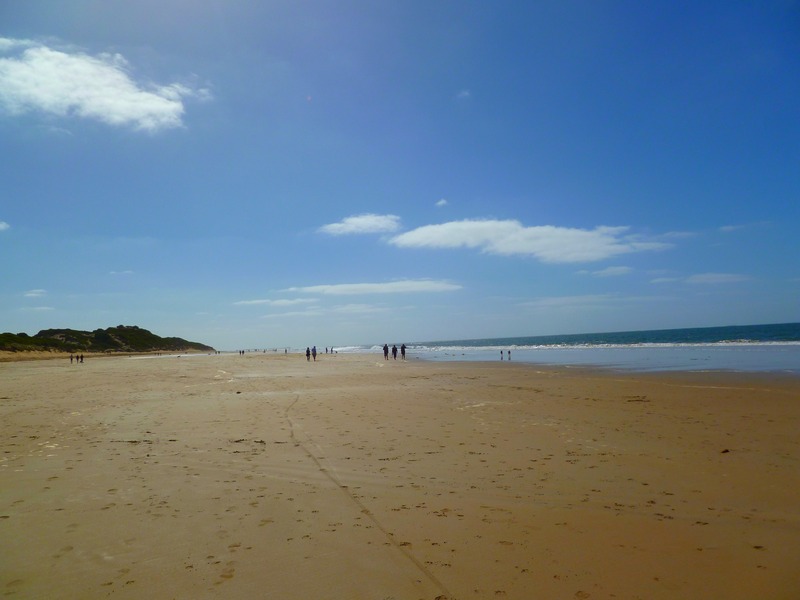 The damp sand is solid enough for walking so we continue along on the beach, fielding some stray balls for eager pooches, chatting with other walkers and taking in the sights and sounds of this sun-blessed beach. It’s another beautiful morning on the surf coast! We reach Yellow Bluff and decide to head back along the beach and take the last possible path back through the dunes to reach the trail. Our pace has slowed by now and we’re a little worried about losing our way. The drone of a plane taking off from the airport lets us know we’re on track. Soon we can see the car park in the distance. We egg each other on to a “sprint” to the finish and reach the line in an undisputed photo finish. The car park is now full. Either the surf’s up or there’s a “clothing optional” event happening. Neither is intriguing enough to restrain us from slumping into the car and prising off our walking shoes and socks. Our cheeks are flushed. We have windswept hat hair. Our legs are heavy. We’re all chatted out. But we’ve done it: Surf Coast Walk Section 1, walked and talked.